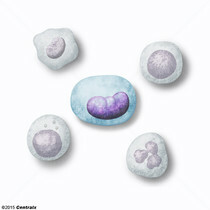 Immature ERYTHROCYTES. In humans, these are ERYTHROID CELLS that have just undergone extrusion of their CELL NUCLEUS. 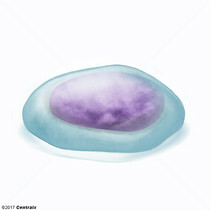 They still contain some organelles that gradually decrease in number as the cells mature. RIBOSOMES are last to disappear. Certain staining techniques cause components of the ribosomes to precipitate into characteristic "reticulum" (not the same as the ENDOPLASMIC RETICULUM), hence the name reticulocytes. 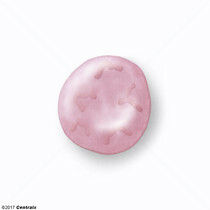 Large, phagocytic mononuclear leukocytes produced in the vertebrate BONE MARROW and released into the BLOOD; contain a large, oval or somewhat indented nucleus surrounded by voluminous cytoplasm and numerous organelles. 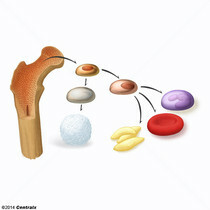 Cells contained in the bone marrow including fat cells (see ADIPOCYTES), STROMAL CELLS, MEGAKARYOCYTES, and the immediate precursors of most blood cells. 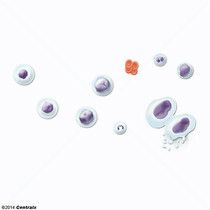 Immature, nucleated ERYTHROCYTES occupying the stage of ERYTHROPOIESIS that follows formation of ERYTHROID PROGENITOR CELLS and precedes formation of RETICULOCYTES. 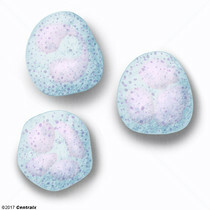 Popularly called normoblasts. 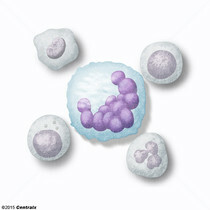 Very large BONE MARROW CELLS which release mature BLOOD PLATELETS.